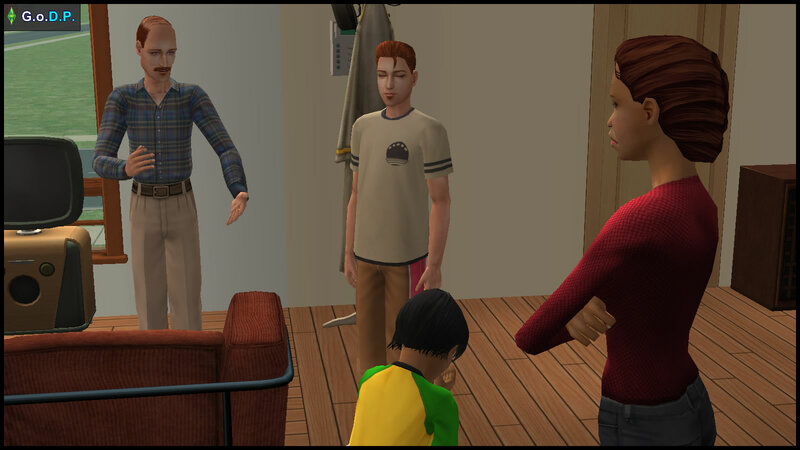 The “default Sims 2 starting situation” (of Daniel married to Mary-Sue, with teens Angela and Lilith) begins in the middle chapters. The starting chapters are about Daniel’s early life with his sister Jennifer. Daniel Pleasant had always enjoyed football. He especially looked forward to weekends, when his father, Jeff, had the time to kick a ball in the yard with him… while his younger sister Jennifer looked on. After an hour or two, they would head back indoors to enjoy refreshing fruit juice and chips, while watching the live football match on TV. 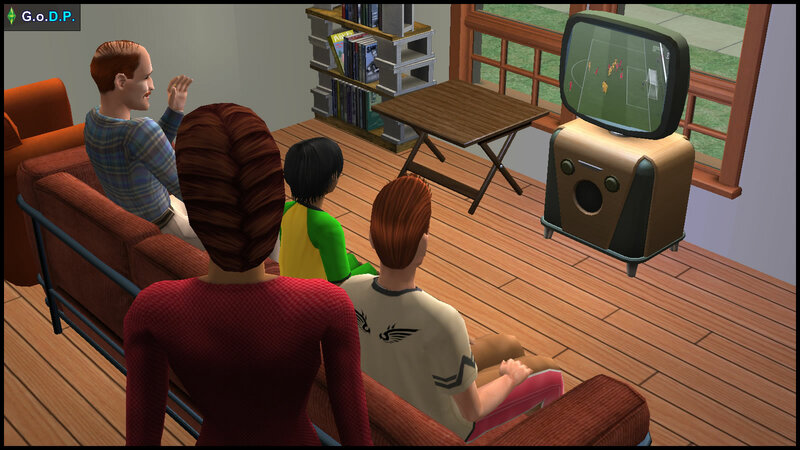 Only three out of the four members of the Pleasant family would sit cheering, with their eyes glued on the TV. Daniel’s mother, Diane, would refill the cups and plates, smile at her husband and son, while tutting softly at Jennifer. A little girl watching football as enthusiastically as the guys? Unheard of in her day. She never understood why Jeff would encourage her by buying her that boyish jersey. Daniel swallowed his chip a little too quickly, causing a minor choke that was quickly alleviated by a large gulp of juice. Jennifer Pleasant stood up from the sofa, crying “I hate you, Daddy! I hate you, Daniel!” before bursting into tears, and storming off to her room. Daniel had a successful first year of training. Simley Town B was so impressed with his progress, that they allowed him a place in their Starting Eleven. Now fourteen, Daniel was excited to be able to start the match playing on the pitch, instead of being stuck on the substitutes bench. His parents took the news much better than his nine-year-old sister. 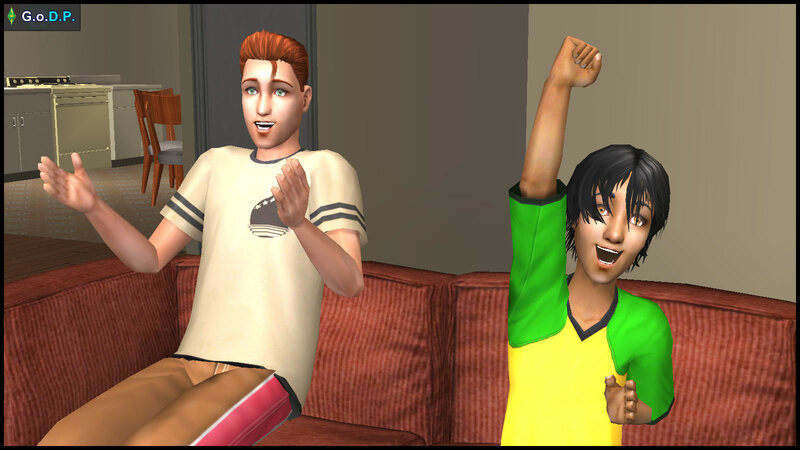 While Jennifer still watched football with Jeff and Daniel, the only time she made any noise was when she was cheering for a goal. Jeff Pleasant panned his head around the living room, and shot a quick glance at the empty part of Daniel’s duffel bag. Father and son started ransacking the living room. Just then, Jennifer emerged from her room, bawling, as her ear was being pulled by Diane. In Diane’s other hand, were a pair of football boots, which she released into Daniel’s outstretched hand. Daniel packed the boots quietly into his duffel bag. Jennifer bawled even louder. Daniel closed his eyes to stay calm. In the car, Daniel wondered how things would be different if Jennifer were a boy. He was quite sure his parents would be proud of having two football-playing sons. However, his parents were traditional, and his sister was now whining in the car. Daniel remained quiet, as he did not have the heart to make things worse for her. More importantly, Daniel needed a clear mind to focus on the match: the first time he is starting the match for Simley Town B in the Under-18 League. He must not waste this opportunity to make an excellent first impression. How will young Daniel Pleasant fare in his first official match? How will his family react in the audience? Good to hear from you again. Hopefully you’ll have it much easier in your new area. I’m still reviewing the STM scripts, so GODP is a relatively bite-sized Sims side project. GODP’s “pacing” may vary, as some events in Daniel’s life would be covered in greater detail than others. The tale strikes a balance between football and family themes. As much as the PVCS matches make “terms used during a football match” more accessible to simmers, GODP is a closer peek into the “trials and triumphs of a football career”. Kinda like what ALiST was suppose to be for CoOH…yeah…they’re still there, just…undergoing revision to suit changing state of our lives. Saw that chapter. It’s interesting that they also interpreted Daniel’s sport to be football / soccer 🙂 … and that Johnny Smith was playing too. It’s an uphill battle, but we’re still fighting. I guess Secreti’s film and literature enthusiasm keeps the Machinima interests pretty high, but I’m getting more into screenshot format with some minor story ideas. Very nice first chapter 🙂 I like the attention paid to gender roles, equality is always a great feature of your work – and it foreshadows the inclusive teams of PVCS nicely. There also seems to be some notable tension in the Pleasant family (as usual 😛 ) – I wonder how that will affect Dan and Jen? 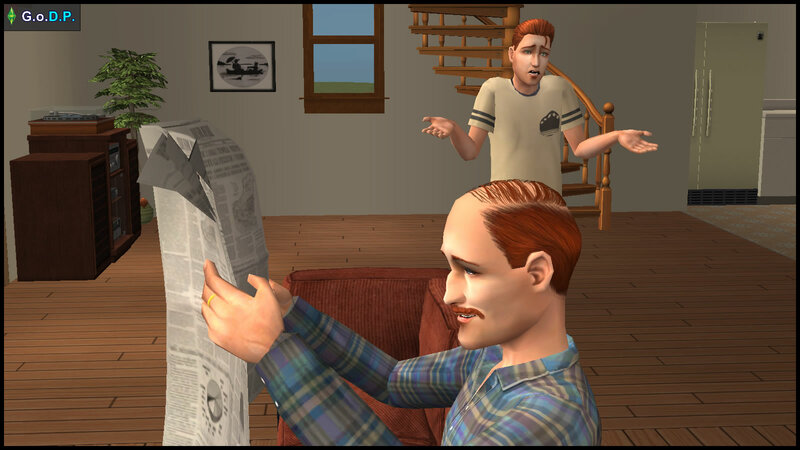 I hope more sims fans would see the potential for exploration of such universal issues, in what appears to be a niche topic that’s typically outside what the simming demographic tends to be interested in.